One of my biggest pet peeves about a lot of recipes and cookbooks supposedly geared towards families, is the multiple appearances by this sentence: “And your kids will love it, too!” It is usually tacked on to the end of a recipe intro as though the phrase alone will make the scrumptious looking Crab and Kale Cakes (with Rouille!) magically appealing to your children. I always want to ask, How do you know this exactly?? Have you ever met my kid? Have you ever met my neighbor’s son who subsisted solely on oil-cured black-olives for the entire third year of his life? When I started Dinner: A Love Story, I made a vow to myself — having, of course, written this same sentence several times before in my various magazine jobs: I would never presume any other kid likes something that my kid likes or pretend to understand the way kids palates are programmed. I would merely write about the foods that my kids eat and hope that this would inspire parents to experiment at their own dinner tables. I would never ever write “And your kids will love it, too!” I promise! But now, I’m afraid, I’m going to have to break this promise. Because, really, I have yet to meet a kid that doesn’t at least tolerate these French fries, or as they’re known in our house, these “Mega Fries.” I realize this is not such a giant risk to take — even if they are a somewhat healthy version of French fries, they are, after all, still French fries. But then again, my daughter does not like pasta, which is every bit as universally loved as a fry. And my nephew doesn’t like pizza. And last weekend, Phoebe’s friend, who won’t drink a glass of orange juice, took a big spoonful of fermented beans at the Korean restaurant — I think that’s what they were — even though she didn’t have any idea what they were. Ok, forget it. I give up. I have no idea if your kid will love these. But it’s certainly worth a shot. Heat oven to 425°F. 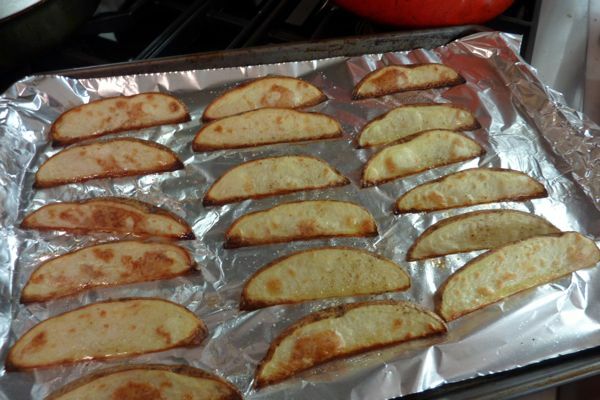 Cut two baking potatoes, or about one potato per diner, into wedges as shown. Toss them in a bowl with olive oil, salt, pepper, and a splash of water. (To upgrade to spicy mega fries, add a pinch of cayenne, paprika, and garlic salt. Make sure spices are evenly distributed.) Lay down foil on a baking sheet and spray with a little cooking spray. (Crucial. They will be hard to remove from foil otherwise.) Line up your fries in rows as shown and bake for 25 minutes or until they are crispy and golden looking. Sometimes, I turn a piece of parchment paper into a cone and let the girls carry their stash around. Oh my gosh — these were our favorites when we were kids. I bet my mother made them twice a week. We would eat leftovers (if there were any) with. . .wait for it. . .melted cheese. I haven’t made these in forever . . . thank you! even though no one in our house likes cooked cabbage. BTW my 10-yr-old god-daughter doesn’t like fries, and I keep telling her she is blessed and should stick with that line and never try them again if she can. We make these oven fries weekly, and I find wasting a ziplock bag worth making sure each wedge is better coated with the oil and spices. Tried your risotta on Sunday—had never been brave enough to try making it before and it was a huge hit with the adults and my 2 year old. Adding pork shoulder to our list for this weekend, thanks! Anything like this is a huge hit at my house. We do regular old potatoes, sweet potatoes and butternut squash. Maybe we should try turnips? Beets? My question is … do you flip them about half way through cooking? I usually have to or they’re crispy on one side and kind of smushy on the other. Or is there something I’m missing? Agreed. My kids will eat more adventurously than most, but french fries will always be on the top of their list. I do assume that if my kids will NOT eat it then there is little chance someone else will either though. The parchment cone, my kid would love. We’ll have to see about the fries. As a mom to a kid that doesn’t like many “kid favorites” (like pasta, like pizza etc) I appreciate your reluctance to embrace the ‘love’ phrase. These look amazing! My husband and I will love them, but I’m pretty sure my 3 year old won’t eat them because they don’t resemble tupical (thin cut) fries. She decides what she will and will not eat by sight – there is no trying something to see if she’ll like it. She’ll examine a new food from all angles and will either take a bite or push the plate away. Its that simple – there is no negotiating. She’ll only eat green vegetables, loves apples but they have to be peeled but NOT cut into pieces and won’t touch chicken with a ten foot pole. I tried hiding pureed chicken in rice and pasta dishes but she can taste it and just spits it out. We rarely order off the kids menu at restaurants – instead I order her an adult meal and I just eat the leftovers for lunch the next day. Yes, I actually have a child, now 10, who will not eat potatoes in any form. I’ve always thought it was strange that this was the vegetable that received her scorn since she is a very flexible eater otherwise. My kids would definitely love these! 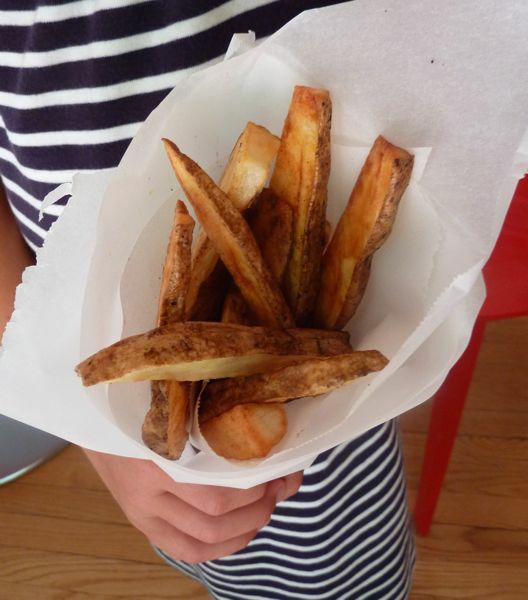 My son won’t eat any form of fries, but he’s gradually starting to eat (overcooked!) pasta. my daughter will not eat french fries. or mashed potatoes. or baked potatoes. what three year old doesn’t like FRIES?? i worry she’s not mine considering potatoes are a bit of a staple of mine. but i will try these out. That picture of the mega fries in the paper cone reminds me of Belgian frites! If you haven’t tried andalouse sauce, you’re missing out. These look great, though. Always preferred bigger fries to smaller ones. Why didn’t I discover these before?? Just made them, and they turned out great. I’m eating them straight off the baking sheet now. YUM. These are unbelievable. Keeper recipe!